I have been thinking a lot lately about the values that we as physicians share. Although we have different ideologies and perspectives, we are united in our passion to do right by our patients and our commitment to lifelong learning. Our fundamental values are, I believe, more aligned than not. Through initial certification, ABIM attests that a doctor specializing in internal medicine or one of our subspecialties possesses the knowledge and skills to deliver competent care. When I see doctors carefully hanging their ABIM certificates in their offices for all to see and using “board-certified” to describe themselves, I am reminded that the entry-level credential is one that physicians deeply value. For many decades, physicians who hold an ABIM credential have rightly felt special because it is a source of personal pride and identity. The ABIM’s initial certification credential has had almost universal respect and trust from physicians and the public, but, as became very apparent over the past 12 months, the same cannot be said of some aspects of the ABIM’s Maintenance of Certification (MOC) program which were introduced last year. This flawed program quickly became a lightning rod for legitimate physician dissatisfaction and anger. Humbled by the feedback, on February 3rd ABIM’s board hit the ‘reset’ button. 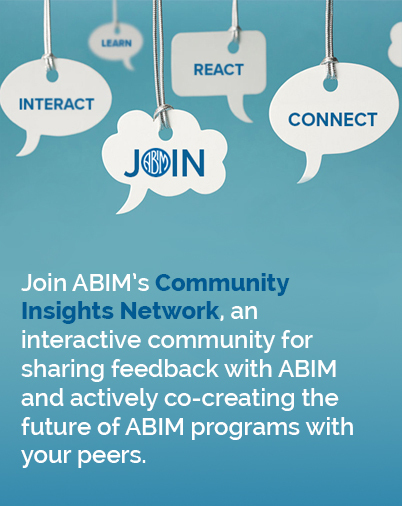 We are sincere in our desire to work openly with the internal medicine community to rethink some of the ways in which ABIM serves physicians and the public. Even as I have heard from some that once physicians are certified, there should be nothing further required of them to maintain that credential, I have heard from many others that there IS a value in keeping up and in publicly demonstrating to ourselves, our patients and our colleagues that we have done so. Clearly, knowledge changes dramatically over time. But so do expectations for how physicians will practice. Patient advocates, hospital leaders, insurers, employers, government and others praised and supported the profession for declaring that once-and-done certification is not enough to prove ongoing competence in a medical specialty. It was a public step that helped earn their trust, something our profession continuously needs. I think that most doctors agree that keeping up is important, and that we owe it to our patients and our colleagues to do it comprehensively and well. I have heard clearly from many that any process leading to a credential that attests to doctors keeping up needs to be a heck of lot simpler and far more relevant to our daily lives than some of what we have been doing in ABIM programs. We have enough busywork and hassles. We want this work of “keeping up” to be meaningful and efficiently documented. But getting back to those shared values—maybe before moving forward to sort out what “keeping up” is all about—we need to discuss the values we share, so that we can figure out a program that is, indeed, meaningful. Are those values we share? Are there some I’m missing? Are there some on the list that aren’t part of being a good doctor? I’d love to hear others’ thoughts on what values we collectively share in our quest to serve our patients by being the best doctors we can be. To help keep you informed on our progress, we will be posting regular updates to this blog and I encourage you to share your thoughts with me via e-mail.